Here’s a postscript to the previous blog, since the Catholic schools continue to make news on the basketball court. Amazingly, the No. 1 team in America now is the Gonzaga Bulldogs, a little Jesuit school from Spokane, Wash. Of course, the Zags play in the anemic West Coast Conference, so don’t expect them to drive toward the championship. The more compelling news is the announcement that the “Catholic 7” – Georgetown, Marquette, Villanova, Providence, St. John’s, Seton Hall and DePaul – will create a basketball-only conference next year, assuming the name of the Big East. They will likely add Catholic schools Xavier and Creighton, and look for a 10th school to round out the conference in future years. The other big Catholic school, Notre Dame, also now a member of the Big East, will be joining the Atlantic Coast Conference, along with Louisville, Syracuse and Pittsburgh – at least for basketball. 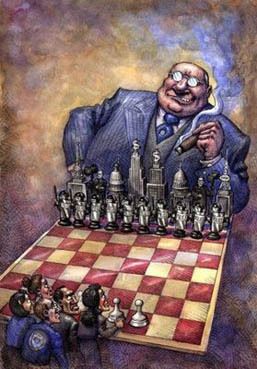 And thus does the bouncing ball tend to follow the millions of TV money available for the elite football schools. More about that some other time, but I want to revisit last night’s action and yet another Notre Dame miracle, this time for the Lady Irish who went three overtimes to knock off Connecticut. Anyone who watched that game would have to acknowledge that chick hoops rocks. 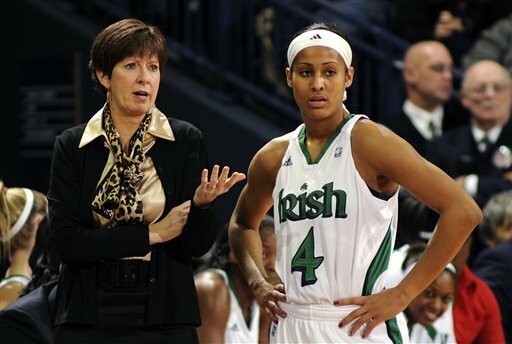 Notre Dame Coach Muffet McGraw has some instructions for her star, Skylar Diggins. How can you not like a team that is coached by the brilliant and poised Muffet McGraw and stars the resourceful and indefatigable Skylar Diggins? McGraw spent half the game on her haunches on the sidelines in a dress and high heels, making both a basketball and a fashion statement. Diggins played every possession of the three-overtime game, 55 minutes, scoring 39 points and hitting key shots down the stretch. As we get ready for the women’s conference tournaments this weekend, it’s refreshing to see outstanding teams like the Irish and Lady Huskies, although I can’t muster much love for the man among the great women coaches, UConn coach, Geno Auriemma. Auriemma has the best winning percentage among all women’s coaches, but he also recruits the best talent year in and year out, sending many of them on the WNBA. And he’s arrogant. Yeah, what’s not to like? As a former girls basketball coach, I’m a big fan of the women’s game and coaches like McGraw, Tara Vanderveer at Stanford, Vivian Stringer at Rutgers, Jody Conradt at Texas and the indomitable Pat Summitt of Tennessee. Summitt, who won more college basketball games than any other coach (1,098), had to turn over the reins of her team this year, after 38 years of coaching, to deal with the onset of Alzheimer’s. A well-coached women’s college basketball team plays the game “the right way,” with no one individual generally dominating play, which occurs mostly below the rim (where I had to play). They pass, move without the ball, run the break and nail three-point shots with amazing precision. But there are exceptions, such as the athletic Candace Parker who actually beat all the boys in the high school all-star game dunk contest. Candace went on to win national titles for Summitt at Tennessee and now plays for the L.A. Sparks. And then there’s Brittney Griner, the 6-8 star center for the No. 1 Baylor Bears. Earlier this year, Griner became only the second women’s player (after Parker) to dunk twice in a game. Hold on to your hats: March Madness is on the horizon!